independently in its functional activity. Therefore VWF and ADAMTS13 in concert will contribute to the risk of arterial thrombotic events on the background of other risk factors of cardiovascular diseases. VWF together with platelets may then be the final effector of occlusion. This mechanism suggests that functional polymorphisms in these genes, either separately or interacting could modify the particular risk derived from this system. Whereas the level of VWF can be measured exactly by the VWF:Ag, its functional activity is described by several less accurate assays including Ristocetin Cofactor (VWF:RCo), collagen binding (VWF:CB) and factor VIII binding (VWF:FVIIIB). 1) To study the impact of the level of VWF alone versus its functional activity on triggering cardiovascular events in a cohort of female patients and controls from the CORA study, including the cases of 210 consecutive women with incident coronary heart disease and 230 population-based randomized women from the same neighborhood as controls by determination of VWF:Ag and VWF:CB. 2) To catalogue a set of 34 single nucleotide polymorphisms (SNP) of the VWF gene in order to establish the common VWF haploytpes present in our population. 3) To catalogue a set of 17 SNP of ADAMTS13 in order to establish the common ADAMTS13 haploytpes present in our population. 4) To estimate the impact of particular VWF and ADAMTS13 haplotypes alone and in combination on the risk of cardiovascular events. 179 patients and 229 controls were evaluable for our study. We found a significant correlation between both VWF:Ag and VWF:CB and the risk of incident coronary heart disease in patients compared to the control group (Fig. 1). However, the ratio between VWF:CB and VWF:Ag was close to 1 suggesting that the VWF functional activity was not independent from VWF:Ag and that VWF:Ag elevation itself correlates with risk. 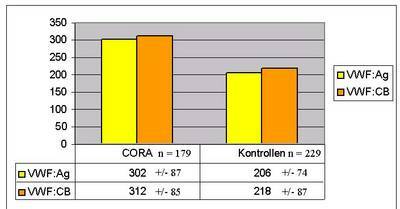 Fig 1: VWF Ag and VWF:CB in cases and controls from the Cora study. To date 34 SNP were analyzed in 88 individuals and 8 families with 24 members. The data will now be evaluated by haplotype analysis using the Expectation-Maximization (EM) Algorithm by the computer program FAMHAP. Haplotypes from 31 individuals, 7 trios, 1 nuclear family with two children and 1 nuclear family with four children, were established by applying the Expectation-Maximization (EM) Algorithm by the computer program FAMHAP. We identified 4 major haplotypes with frequencies above 0.05 and 2 additional haplotypes with frequencies > 0.03. These 6 haplotypes make up 75 % of 20 haplotypes in total, derived from our calculations (Fig. 2). On the basis of established haplotypes of VWF and ADAMTS13 a set of diagnostic SNP will be chosen for further haplotype analysis of a larger cohort. The major haploytypes which include amino acid polymorphisms will be analyzed in cases and controls from the CORA study, both individually and in concert of VWF and ADAMTS13 by using high throughput techniques. If amino acid polymorphisms or specific haplotypes of VWF and/or ADAMTS13 contribute to the risk of myocardial infarction, functional studies of such polymorphisms using recombinant technology will follow. A correlation between the VWF/ADAMTS13 system and the risk of cardio-vascular events would help to decide for the appropriate prophylaxis against a 2nd event. Such patients could probably profit in particular from platelet aggregation inhibitors.